And then I burned dinner. Like, it’s not bad enough that I turned on the oven, that I turned it up high and that I had it on for 30 minutes. I didn’t cover the dish and the sauce was charred black and what, you expect me to think of these things ahead of time? But despite all of this, this might be the best chicken I have ever made. Was I ever glad I’d let this recipe sneak up on me, take residence in my brain and nudge-nudge me to even get over my issues with fish sauce [“It’s fishy!” “It’s not fishy, Deb.” “People who like fish always say that things are not fishy but they always are.” –1 day later — “Wow, this is not only not fishy, it might be the best tasting thing on earth. I will put it on everything, henceforth.” Fin.] because this is perfection. Likely even more so if you have a grill… you know, so you don’t have to heat up your kitchen during a heatwave? That sounds like something smart people would do. This recipe was intended for a grill but lacking in one and itching to try it, I roasted it in the oven. I like cooking chicken on high heat; I was converted to this method thanks to Zuni, and haven’t looked back since. The chicken gets cooked but not dry, the skin crisps. All of these things happened, but the sugars in the sauce caused it to burn. The next night I made the chicken again, and this time covered the dish. The sauce still blackened, though not as much because I sprinkled a couple tablespoons of water. I realize this doesn’t give you a very solid cooking technique to draw from; I realize that this recipe may benefit from a another round but I don’t want to waste your time. I don’t want to keep you from having this for dinner in the next 24 hours because I honestly don’t think you’ll care how “caramelized” (ha) the sauce might get in the oven, the chicken more than makes up for it. I warn you, if you serve this with mango slaw, a quick addiction may form. Combine the garlic, cilantro, fish sauce, vegetable oil, hoisin sauce, coriander, kosher salt and pepper in a blender until smooth. Arrange the pieces of chicken in a large, shallow glass or ceramic dish. Pour the marinade over the chicken and turn to coat the pieces thoroughly. Cover and refrigerate for several hours, or overnight. Both methods: Once cooked, transfer to plates and serve with Thai chili sauce. Do ahead: The marinade can be refrigerated overnight. I like it so much, I am tempted to make a larger batch of it to keep in the freezer until needed. * Don’t like fish sauce? Don’t want to eat it? Neither did I before about five minutes ago. Anyway, I often see low-sodium soy sauce suggested as an alternative but I’m not convinced it’s a fair swap. There’s something more caramelized and fermented in the fish sauce that you’d miss. If you feel like playing around, I might whisk some additional hoisin or even miso into that soy sauce for a more complex flavor. ** To ensure your chicken is “cooked through”: Lacking x-ray vision and decades of chicken-cooking practice, I’m a big fan of using a thermometer to ensure that my meat is properly cooked. A thermometer inserted into the thigh/leg joint should register 180 to 185 degrees if you’re following Proper Chicken Cooking Protocol, or 170 to 175 degrees, if you’re me, and have very specific chicken-cooking preferences despite what food safety experts advise. I like to live on the edge, obviously. Another classic, though less precise way, to see if chicken is cooked through is to pierce it with a knife. If the juices that run out are clear, your chicken should be just right. I can barely turn the oven on in these 90 degree temps. I would cry if I burned dinner…then I’d make my husband go get pizza. I think these would be going on my grill! Fermented fish sauce sounded unappetizing to me until I tried it too… I’m a convert. That actually doesn’t look too bad. Normally, asian cooking scares me because it has 284534 ingredients. Seriously. The fish sauce adds goodness. The fish sauce itself is… Whatever you do, don’t smell it! But it adds much goodness. I’m going to try this as soon as the temperature drops below 90 degrees again. I love all sorts of asian-inspired sauces! I’m not the biggest meat eater though, do you think this sauce would work with tofu or tempeh? I can’t get my husband to eat anything with fish sauce in it… but I might modify the recipe and cook it anyways! I hate to be cliche, but I’m not a big chicken-on-the-bone person. That said, this recipe looks ridiculously delicious! I love love love fish sauce. I throw it in thai salad dressings, stir fries, curries….you name it. Pleased to hear you are now one of the converted. I share your grill-less agony. I’ve smoked up my kitchen a few times this summer when normal people are smoking up their back yards. I have no problem with fish sauce, so I’m adding this to my to-make list. Thanks for braving the scorching kitchen to bring us this recipe! Fish sauce is a favorite ingredient around here, especially as it is slowly but surely helping me to teach my children that foods they dislike on their own may be good as an “ingredient.” Therefore they don’t ALWAYS reject foods based on one ingredient. Plus they will eat vast quantities of raw veggies if they have some nuoc cham to dip them in. I once sent a friend the ingredients for Tom Kar Gai and her teenage daughter tasted all the ingredients on their own, only stopping once she had tried the fish sauce. I will make this soon on my grill. Maybe that will make up for heating my kitchen during that awful heat wave to make sour cherry jam and sour cherry cake! Fish sauce *is* unappetizing, at least until you taste it! I still think it smells like feet, but I love the way it tastes in things. Light soy sauce has a completely different flavor profile. There’s a vegetarian “fish” sauce out there somewhere (I think it’s mushroom based? ), but I’ve never actually tried it, so I’m not sure whether it’s a decent substitute. This looks fantastic. Could I make this with bone-in (or boneless) chicken breasts – grilled? I love any meat with a thai-style sauce, these look delicious! I bet it would be easy to use chicken breasts too! That’s totally something we would do. Once we decided to make Beef Stew during a heat wave. Big mistake. I do love Thai food and so this is going on my must try list. Looks & sounds good. I use the poke and peek test method when I have a bunch of pieces of something… I just designate one as my “tester” to gauge when it’s done & then I have one to taste test before it goes on the table. Oh, fish sauce. Smells like a Chinatown street in August (ughh), but tastes so very, very good! It wasn’t till I started using fish sauce that my forays into Thai and Chinese cooking really started tasting right. You’ve made me want to go home and cook Asian tonight! I see Tamari in the picture.. but not in the list of ingredients for the recipe…. is that an oversight…? or is the picture not of your mise en place? 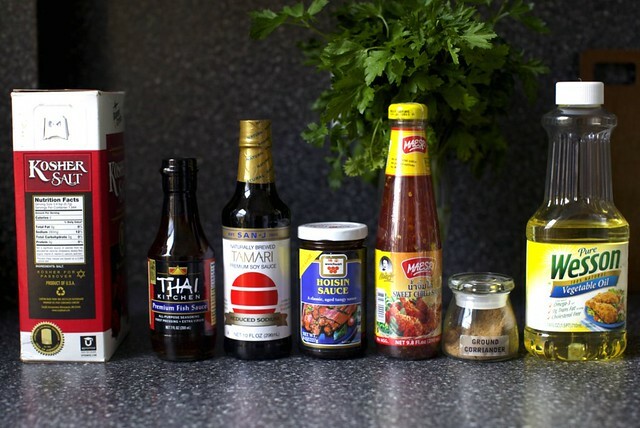 Fish sauce adds a mysterious background note to so many Thai and Vietnamese dishes — it’s the secret savory flavor that elevates dipping sauce, marinades, and noodle stir fries. Three Crabs is my favorite brand — look for the three crabs on the bottom of the glass bottle to make sure it’s not a pale imitation! I like the fish sauce addition and all of the spices to the marinade. I’m a fish lover and it’s true, the flavor is not so much fishy as much as it has a good ‘umami’ flavor. Also, I don’t use a thermometer when I grill chicken, I just take it off when the leg moves easily around the socket, but I am sure the thermometer makes for a much more fool proof technique. I was just thinking how I wouldl like wings last night… I wonder if this sauce would work well on them. Woot… I will die for Thai food.. Looks yumm. H/Tamari — I had it on-the-ready in case I could not handle the fish sauce. It ended up not being necessary. Epicurette — WINGS. I love that idea. Especially on the grill. I’m so excited! I have all of the ingredients to make these tonight! Except the chicken legs, but I can easily grab those. You’re crazy! I can’t believe you turned your oven on last Tuesday! Everything I’ve cooked for the past weeks has required nothing more than 15 minutes on the stove (if that). This chicken sounds great…and I agree with your *note that omitting the fish sauce would compromise the flavor of the dish. Please let us know how it works with miso works I think it would be somethin’ like this: http://www.food52.com/recipes/3296_misoyaki_roast_chicken_with_shoyu_onion_sauce ? i am the opposite: not a chicken person except for when it’s served to me, but i could come around to anything if fish sauce is drizzled over it. thank you – the marinade looks like it’s right up my ally and i love the idea of using mushrooms. this looks like one to try on the grill next time! I love a good asian sauce for chicken! Fish sauce is my favorite this-dish-needs-something-but-I’m-not-sure-what ingredient. It makes everything richer and delicious and savory. That marinade does sound delicious! I had to turn on my oven last Tuesday too, so I feel your pain. I was cursing the function I promised to bake a cake for. Thanks for posting this recipe and the portobello tip before 4pm – the cutoff for changing my Peapod grocery delivery list. Living in New Haven without a car, I’m always jealous of NYC’s fully-stocked international bodegas on every other corner. I couldn’t even find unsalted butter in three different walkable locations over the weekend. So portobello and fish sauce would have been a lost cause without delivery. Fish sauce is one of those ingredients where you hate it until you try it. It has been a staple in my house since I was growing up, but when I made stir-frys on the Mainland after college, my roommate would complain. But, if they didn’t know I’d used the fish sauce (like, if they were outside while I was cooking), they loved the results! Be sneaky with those who say that “hate” it, and I think they’ll be converted too. It’s so true that fish lovers tell you something isn’t fishy and then it totally is! I don’t like to turn the oven on at all in the summer (although I did on Saturday to make the Pioneer Woman’s cinnamon rolls…how could I not?). I think your “summer” section needs an “ovenless” subsection. Please? Mmmhhhh. I just had Thai yesterday and was thinking I need to learn how to make it. Thanks for the encouragement. Deb, if you want to cook without heating up your kitchen, you need to get a crockpot. Also, you need to get the cookbook Not Your Mother’s Slow Cooker Cookbook. This book has changed the way I cook in the summer; I’ve made cakes without turning on the oven, tapioca pudding, and meatloaf without breaking a sweat. Right now I have a whole chicken in there, cooking away. I normally hate all things fish, including shellfish and any creature that swims with them! However, my boyfriend is Thai and fish sauce is in just about everything his mother cooks. I love Thai food, and have wanted to make Pad Thai forever but have a major mental block about actually bringing fish sauce into my house. I’m going to have to try it for this recipe – I’m thinking grilled Thai chicken wings will be on the menu this weekend! Thanks! P.S. I feel the same way about sauces and dressings made with anchovies – love the flavor they add, as long as I can’t identify them in my food! My husband will not eat fish in any real capacity but he loves thai food with fish sauce in it -definitely going to try this. Thanks so much for this recipe! I’ll be trying it out shortly. One of my heatwave cooking survival mainstays is marinating chicken parts, and then cooking them late at night just before going to bed. I make sure the kitchen is basically shut down and then turn the oven on and pop the chicken in. We watch a movie, pulling the chicken out to cool when the timer goes off. The chicken goes in the fridge to eat over the next few days. I often do barbecue sauce or Nigella Lawson’s buttermilk chicken. I think yours will go into heavy rotation. The Mango Slaw is amazing, even with red cabbage! The Napa was gigantic when I went to buy it, so I chickened out and bought the red. But my sister has a 1/2 a gigantic Napa and she’s bringing it tonight – with more mangos – so I can convert her to the ways of slaw. Now on to the chicken! You are nuts to turn on the oven in those temperatures, but thanks for taking one for the team. This chicken looks fabulous! I am making your mango slaw tomorrow night and will serve it with grilled wild chinook salmon. This has at least inspired me to make some sort of Thai-style glaze for the fish. Thanks, again, for your marvelous website. I feel like the universe is telling me I need to make these. And I was cosmically drawn to check out your website today. I literally just got off the phone with my husband and we had the, “What do you want for dinner,” “Oh just throw those chicken legs in the oven to roast” conversation. Now, our chicken will be more inspired. Thanks. Is the 2 tablespoons of hoisin the already-doubled amount, or do you recommend doubling it to 4? Jessica — The amount is not doubled. I love fish and tried to cook with some fish sauce for the first time yesterday thinking it was “fish” sauce kind of like “oyster” sauce. I threw a small amount of fish sauce in the pan and the smell induced a gag reaction that drove me out of the house! The dish went right into the trash and the trash bag went immediately outside where the yellow jackets and flies went berserk! It didn’t just smell like fish it smelled like rotten fish and I love all (make that MOST) things fishy! So I will not be a fish sauce fan in the future. Otherwise, I have been a lurker for some time now and most of your recipes are quite yummy! I have the same fish sauce aversion – maybe this will make me finally get over it. And I also have plans to use my grill for the next two weeks. I look forward to trying this out! I’m not much for Thai food necessarily, but if you say it’s the best, well, Deb, I just can’t doubt you. Plus I’ve always had a thing for chicken legs; they seem to be the awkward younger sister of chicken pieces. And it’s about time they get some love! As a vegetarian substitute for fish sauce I’d recommend mushroom sauce– soy sauce with shiitake and oyster mushroom extract in it. I get it at my favorite Asian market. It’s similarly seriously addictive– I want to put it on everything, everything. Do you think this marinade would work well on tofu? I ask not because I’m a veggy – i am very much not given that pork chops are on the menu tonight – but cause i did firm tofu on the BBQ last night but my tahini-lemon marinade didn’t really do the trick. I saw potential though and I need something that the tofu can soak up a bit first. Thoughts? I really love this recipe, and I can’t wait to make it. There is something so summery about eating chicken legs. Maybe it’s because I grew up (and live) in the south, and anytime you mention chicken I immediately associate with my home. I like the combination of spices here, but I’ve never had fish sauce. Sounds mysterious! I was wondering what the mango slaw was supposed to go with! I am impressed that you turned the oven on last Tuesday. I did not. I did crank mine up to 475 yesterday for a loaf of Lahey bread, but it was only about 90 outside. That looks delicious but I could never cook it. Raw chicken – especially bone-in chicken – creeps me out. Could you possibly send me some pre-cooked samples :) Or maybe I could handle making this with a boneless chicken breast? Or maybe I could grow up and handle chicken!? I bet this would be great on tofu, but the thought of eating anything above room temperature right now makes me want to cry. Maybe in the autumn I can face the oven again. I so love reading your blog! I’m definitely going to try this recipe. I adore your adaptations of the Indian food. They are excellent and my husband loves them too! Thanks so much for being an adventurous cook. I completely understand. Last week during the heatwave I decided making homemade calzones was a perfectly acceptable thing to do. I made everybody play in the yard while the oven was going for our collective sanities. I have no qualm with firing up my oven in the summer- especially for things like this! It looks great, Deb. I made that mango slaw for the second time for lunch today. As soon as I looked at the ingredients I knew that dressing was missing something: FISH SAUCE. Fantastic. Now, if I was also making this chicken I might leave it out, but for mango-slaw as a main dish (or with grilled shrimp on top, like I did), definitely add a generous glug of fish sauce. yum. I just can’t bring myself to cook with fish sauce, again. I had a really, really bad experience cooking with the stuff several months ago. The baby was crying and the food was burning. Needless to say the house reeked of the stuff for days. Not good. Just to throw my two cents in with Nicole and David L – vegetarian / vegan fish sauce or oyster sauce is not half bad to cook with. Stocked at May Wah in Chinatown. Deb, would one of those big All-Clad nonstick grill pans work? ‘Cause I got one . . .
Michelle — I don’t see why not. Funny enough, I have a grill pan. Just didn’t occur to me to use it! Tracy — Marinate it for whatever time you have. I like fish sauce as an ingredient just fine but I hold my nose while I measure it. This is an awesome Asian style recipe! I rarely buy drumsticks since I’m never completely sure what to do with them. I pretty much only cook Asian style due to my husband’s tastes. Thanks! Nice! I got all of those ingredients in the house, can marinade this overnight..can’t I just do it for a few hours instead? Having a fish allergy has really stopped me from making a lot of dishes I’d love to make and going into the many Thai restaurants around town. A few months ago I tried finding some information online for substitutes and for some reason came up empty. This post has been very helpful! Thanks to those who posted suggestions! Looks so good! Thai sweet chili sauce is my latest favorite ingredient…it’s like sweet and sour sauce, but more awesome! Perhaps roast the chicken with just oil, salt, and pepper, then cook the sauce separately and add it on at the end? Or you could baste the chicken with it halfway through, to get the flavour but avoid the burning. Just finished this wonderful chicken and the amazing slaw. What a great summer dinner. I just baked it in the oven, basting often after the foil was removed and cooked it a bit longer, as I have a husband who likes all meat very well done. (insert pity here). Am I missing this post’s picture? Couldn’t find it! Made this today with boneless, skinless chicken thighs and it was absolutely delicious! Moist, tender, and had incredible flavor. Loved it! #22 – Yes! ‘Umami!’ Agreed! I love fish sauce as I’ve grown up with it and learned from my mama that it’s a super flavor enhancer. A few drippy drops in anything, really, and you would never know it’s that stinky (oh noes, not to me!) sauce doing its thing to you. I love trying new recipes for chicken (and simple too!) so cannot wait to try this! Yum! Fish sauce has got to be one of the smelliest but delicious tasting ingredients ever. I love using it mixed with some fresh Asian chili paste or jalapenos/ginger/garlic to create different types of salad dressings. I will forever thank my boyfriend’s Vietnamese mother for introducing me to it, and buying me a giant bottle of the stuff. I agree, there’s no substituting on fish sauce. It smells (much like salted fish and anchovies and the like) but the smoky salty taste can never be replicable. I ALWAYS use fish sauce to salt my mungbean noodles when I make Vietnamese Rolls. No soysauce can replicate that fragrance and taste. Ummm.. ok, thus endeth my fish sauce speech. I’m gonna try this recipe Friday. Even if I’m cilantro-averse. Oh fish sauce! It’s so good in different dishes. Some versions can be extra ‘fishy’ though, and those are the scary ones. :) This chicken sounds great! In my experience, the thing about using fish sauce in a recipe is making sure you don’t have leftovers. If it didn’t smell fishy once it was cooked in, it will the next day. My daughter made me (forced me) to eat this chicken dish she made and I was pleasantly surprised at how good it was; I really liked it. In fact, I like it so much that she gave me the leftovers. When I pulled that cover off to reheat it..Gag! Never again! You should buy the big bottles of fish sauce from Asian supermarkets. They will be the same or less money than the measly little bottles sold in the more mainstream supermarkets. In fact, this goes for most Asian products – the prices are inflated and the quantities stunted in American supermarkets. Try using fish sauce instead of salt when cooking – you’ll be amazed at how much that simple switch will do for dish. I was surprised that the slaw didn’t have fish sauce and was planning to add some. Glad to see the chicken does. Regarding the “over-caramelization,” you might want to marinate without the hoisin, instead using it as more of a finishing glaze during the last few minutes of cooking. That should take care of your “excessive browning” problem! I’ve been meaning to ask this for a very long time: What on earth is kosher salt? I have never seen or heard about this (as I’m sure nobody in Europe has) and if I have my Judaism right, all salt is generally kosher. So what exactly is it? What a delicious sounding marinade for any cut of chicken. Thanks for sharing! I will eat just about anything that includes hoisin sauce…although, like fish sauce, I think it tastes terrible on its own. I bet this marinade would work on anything you grill–fish, shrimp, pork chops…maybe not steak, but who knows. Looks great. Kosher salt = coarse salt. I’m sure there’s more to it than that technically, but that’s the gist of it. Ahhh-fish sauce, I always tell people who have never tried cooking with it not to open the bottle and smell it. If they do they’ll never put it into a dish they are making!! Truly a strong almost vile odor in the bottle, such a wonderful taste once used in a sauce, marinade, dressing, dipping sauce whatever! Amazing ingredient and totally missed when not added to the recipe! So for all those in fear, hold you nose and pour with proper abandon! oh yeah – i can definitely see these on the grill. i’m with ya on the fish sauce – it IS fishy, but it ISN’T fishy if you don’t overdo it, i think. @mirjam: the name “kosher salt” comes not from being made according to guidelines for kosher foods (as you said, nearly all salt is kosher, including ordinary table salt), but rather from its usage in the process of making meats kosher, where the meat is heavily salted to extract all the blood. Kosher salt has a larger grain than common table salt and no additives. It can replace table salt in nearly every recipe except baking, where a finer grain salt is preferred. Most people feel it has a stonger salt taste than regular salt. I feel your pain about the heatwave cooking. My roommate and I got our CSA share of fresh peaches and cherries and decided the only thing to do was cook a pie and a cobbler. YUM! This is the only thing that could tempt me to turn on my oven in my tiny new york city kitchen! SO easy, lots of great ingredients, THANK YOU! Oh wow! My family would love these. I’m sure the sauce would be great on tofu for me too! Fish sauce also works very well in Caesar salad dressing if you do not have anchovies on hand. Love the fish sauce. It’s my go-to ingredient for upping the umami factor in just about everything. @ 61 (life plus kitchen) – I used to hate dealing with raw chicken too, and it still bothers me sometimes. Something that works well for me is using (Deb, cover your ears) frozen boneless skinless breasts, since I don’t have to handle the slimy raw chicken. You could toss frozen breasts (or even frozen bone-in breasts, legs, or wings) into an oven-safe dish, pour the marinade over, and let the chicken thaw in the marinade overnight. Then pop in the oven, and you never had to touch the thawed raw chicken. Looks delicious! Just curious what brand of hoisin sauce you used? (Can’t quite make it out in the photo.) I find that hoisin sauces vary quite dramatically and would love to get a recommendation. Thanks! Do you think this would work with a healthy dollop of chili paste, such as sambal oelek?? I know you serve with a Thai chili sauce, but wondered if the dose of heat would monkey with the marinade flavors too much? @prklypr: thanks a lot for enlightening me. Coarse salt I know, we just have very different names for it. I’m new to the site and love reading your recipes and have tried a few at home already – but you don’t always say how many they serve? I would guess this recipe serves 8 maybe but it would be great to know as it looks delicious! Alyssa — It’s Weichuan brand; I just got it because it was available. It’s perfectly good but I can’t say I’ve tried one I don’t like. I’m kind of a hoisin junkie. Jules — Yeah, I know, I get that a lot. I am felled by portion sizes. I often just eat a leg for dinner and it doesn’t seem odd to me. I realize that’s not a “normal” portion size. I have a hard time guessing how many things people will put on the table, how much they like to eat… In general, however, most recipes will tell you one thigh/leg per person. This looks fantastic. Something my clients would love (I’m a private chef). I have to laugh at your last comment, though as I too have a hard time gauging how much food people want on the table. Love your site! And for other folks out there – if you don’t use fish sauce today in your asian cooking you are missing out big time!! One of my key for all asian cooking. This looks delish. Does anyone know if there is a kosher version of fish sauce? I second Karen’s crockpot suggestion. Most of my chicken is cooked in the crockpot. If you really want a carmelized glaze, finish quickly in the broiler. I’m trying this glaze this week! Sounds delish!! Regarding the “not this dimwitted 18 months ago”…remember the placenta stuff that came with that bundle of joy…I am convinced some of our brain matter comes out with that!! Because I have had that dimwitted feeling frequently since delivering my cute little babes! I wouldn’t want to accuse them of stealing it from us but the timing is somewhat suspect!! My friend HATES fish sauce, but after his reaction – eating seconds – to your brisket last night, which he swore he wouldn’t like because how could it be as good as the brisket I usually make, I was wasting my time, blah, blah, blah., I’m going to give this chicken a try next weekend. The brisket was fantastic. I used Muir Glen Fire Roasted Tomatoes in the sauce and two chipotle peppers in adobo – the heat subsided after I removed the solids, defatted the sauce, and thickened it. It was delicious; a real keeper. Welcome to the dark side! I’m a fish sauce fan, but when I first bought it I thought I had wasted my money because it smelled and tasted so awful. But then a few drops in Asian style dishes brought out so much flavor I was hooked. A lot will make the dish fishy but a little makes salty umami goodness. These are on the grill right now. Hopefully they are delicious as my three year old kinda quadrupled the hoisin sauce. Made this tonight with chicken breasts instead of legs and it was wonderful. I usually don’t eat the skin, but it was so flavorful I couldn’t resist – that is saying a lot! I’m wondering if the same marinade would work on grilled salmon… I think I’ll be pouring it over everything now! I also made the mango slaw on the side and it was amazing. I’ve been wanting to try it since you posted as it sounds so close to green papaya salad, which is one of my favorite Thai dishes… it was perfect. Thanks for coming up with an entree to go with it. I think my lunch tomorrow will be leftover chicken shredded into the mango slaw, if the slaw lasts that long! We just made these on the grill and the final opinion is that they are awesome. I made this tonight on the grill. I doubled the hoisin as you suggested. I’m sure it did add to the flavor, but beware the hoisin has a high level of sugar, and these things blackened up VERY fast on the grill. I don’t suggest putting them on and walking away as I now have some VERY black drumsticks! Oh, my this looks good. I’m lucky enough to be married to a Vietnamese guy, so I eat fish sauce in everything. I’d just like to second everyone recommending a better quality fish sauce. It never goes bad, and a good fish sauce is to a bad fish sauce as an excellent wine is to a bottle of cooking wine. You just want to use the better fish sauce! ^_^ REALLY. I recommend anything from Phu Quoc island, Vietnam. They make the best stuff there (and you can get it in most Asian grocery stores). Just check to make it’s actually made in Phu Quoc (because of the fame of Phu Quoc’s fish sauce, a lot are called “Phu Quoc Fish Sauce”, but they really come from Thailand!). Hey Deb, Any thoughts on how this would be on turkey drumsticks? I’m guessing the answer is: Amazing! but I thought I’d ask… Also any idea on how much longer they might take to bake than chicken leg quarters? I usually leave turkey to Thanksgiving but they were on sale and I couldn’t resist! Looks and sound sooooo good. Now something else to do with that bottle of fish sauce that I have sitting in my fridge. I just picked up some drumsticks on a whim a few days ago, and was wondering what to do with them, and then your recipe popped up! It’s funny how that happens in the blogosphere. We are adapting these as we speak–I was going to add the water beforehand just to protect against charring, and then decided to just add some soy sauce in its place and reduce the salt. Also added some red pepper flakes and adjusted some other measurements to fit what we had and skimped the marinating time. Looking forward to it, it smells great! I’ll post about it soon! ….this healthy, delicious grilled chicken is a winner…. I find this post particularly ironic since that heat wave is now hitting the mid-west. It’s 94 at 8am, and only going to get hotter. I was thinking… what am I going to make for dinner…. hmmmm… the Northeast just had a heat wave maybe Smitten Kitchen has a no cook dinner up this week…lol. Eileen — Sadly, my “no cook dinners” this week have been delivered in. Though I’ve been making a lot of these salads with this dressing for lunch. That kind of counts, right? Kate — I’ll find her information and email you back — thank you! Readers like you rock! Theresa — I have never cooked turkey legs before. But I want to… I’ve been wanting to braise a turkey leg for years; have you ever? Yes, I know that wasn’t your question but I’m totally allowed to answer a question with a question once in a while, right? Dear Smitten Kitchen: I heart you! And these last two recipes are amazing and perfect together. Served thai-style chicken (boneless breasts) and mango slaw for some friends last night. Cooked up a little jasmine rice to go alongside. Everybody loved it! I marinated the chicken overnight, and it was so tender even the toddler couldn’t get enough. You’ve inspired me to bring thai flavors into my kitchen! And I needed to make something to go with the slaw. We cooked this last night and it was great! For some reason the skin did not get not crispy at all but we were too hungry for that to matter. The taste of this dish reminds me a lot of Filipino adobo. You should try out that recipe sometime as well! Thanks for the wonderful recipe! I made this recipe last night with boneless chicken breasts on the grill and it turned out absolutely delicious :). Love your website! I had this last night! Weird that I didn’t notice you had the same recipe on here. BBQ’d it was really good. I don’t usually eat a lot of meat but I made an exception for this one. Never had Vietnamese crepes and am wondering how they’ll turn out since, sacre bleu! there are no eggs in them. My dad used to totally gross us out by putting fermented fish sauce on his cottage cheese, or anything else that wasn’t moving. As a grown-up, the food things he liked that really bothered me (i.e. how nasty does clotted cream sound?) actually have turned out to be pretty good. Fish sauce included. Anchovy paste to follow. I bet this would be good in a slow cooker! I love fish sauce :holds hands up for protection: o.k. really. I think that even though it’s really salty (don’t try to taste more than half a drop) it gives a depth of flavor you don’t get from soy sauce. It makes all the other flavors shine, while adding its own…I can’t get the word. But it’s not fishy. really. I second the comment above on internal cooking temperature for chicken – it’s 165 degrees. The temperatures you cite are outdated and way too high. I find most people cook their pork to too high a temperature as well. Overcooked meat is dry and tasteless! Teresa — I usually read 160 on white meat, 175+ on dark. I never cook white meat above 160…. 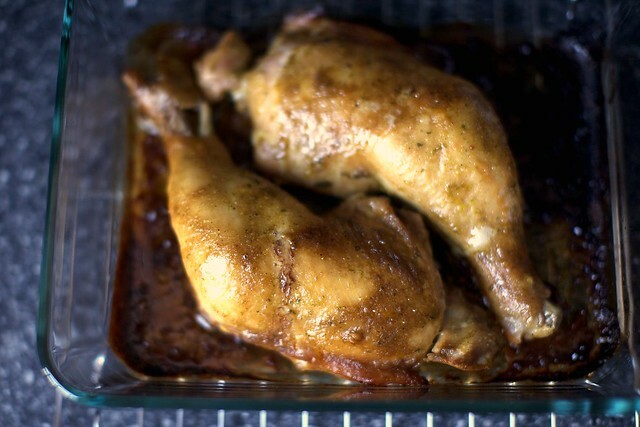 I made this last night with thighs and drumsticks – baked them uncovered at 400F for 50 minutes. I didn’t have any problems with the sauce or chicken burning, but for some reason it was a little salty. Maybe I have a saltier brand of fish sauce? I would probably leave the 1 tsp of salt out of the marinade the next time I make them. Also, I had no time to marinate, only about 15 minutes, and they were still very flavorful! This is awesome! I grilled it and it came out beautifully, and paired with the slaw, it was perfection! Later that night, I took the leftover marinade, reduced it by half, added some (gulp) mayo, and added that, the leftover slaw, and the leftover pulled chicken to make a very un-cool version of… well, something that was delicious. Tiana: try the Grilled Mahi-Mahi with Thai Coconut Sauce from epicurious. Made it night before last and it’s delicious. Deb: YUM! (Thought) I had all the stuff to make the marinade but….ran out of the extra hoisin, used half the fish sauce (again with that “ran out of it” thing) and have an entire cilantro-averse family so used a few green onions. Whirred the stuff up in my mini-Cuisinart and kabob’d skinless chicken breasts that I marinated for only about 2 hrs. It was SO delicious. How’d it get that creamy, almost peanut-buttery flavor? Sweet, savory and perfect with the mango slaw. I didn’t have to strain one little brain-muscle to figure out what was for dinner! Thanks! I am so glad you’ve joined us on the dark side…I mean, the fish-sauce-loving side. It’s amazing. As long as you don’t take a big deep whiff of it in the bottle. These chicken legs sound great! I made this marinade last night coating about 6 pounded chicken breasts (they marinaded for almost 24 hours). I was running a little low on the fish sauce, hoisin and had to use the horrible “squeeze paste” cilantro that comes in the cold section of the produce/ herbs in the grocery but it still turned out savory, flavorful, and tasty (first time I have ever cooked with coriander!). Placed the breasts on the grill, didn’t have any charring problems happy to say. Served with mango slaw on the side- was afraid the dressing would be too tart for the slaw but the mangoes I had were pretty sweet and it balanced out (I threw a little fish sauce into the dressing, like a nuoc cham, and a little splenda). I can’t wait to try it in it’s “full” unadulterated form and with skin-on dark meat which I love, especially on the grill. Thank you again for another GREAT recipe! Made this last night on the grill – YUM!!! And, of course, I had to make the mango slaw too – MORE YUM!! Thanks for introducing me to fish sauce! One question – I see tamari in the photo, but not in the instructions…? OK, I see my question was already asked & answered. :) Thanks for all you do, Deb! For those who were wondering, I made these in my crock pot last night, then crisped the skin for 1 min in the broiler. It worked great! Can’t wait to have the leftovers for dinner tonight! We just got a house two weeks ago…with a DECK!! So of course we had to take our new grill on a maiden voyage with something….thank God it was with these!! (Although, next time I make it, I will not be as impatient, and will let it marinade longer-I only marinaded it for about an hour) We made and ate an entire chicken in one dinner and two lunches. On the side I made Amanda Hesser’s haricots verts with walnut oil. Yum. Made the marinade and have the chix in it. Yours looks brown, mine is olive green! Deb: I found the chicken super salty. I’m wondering if it’s just because I marinated for 2 days before cooking? I liked the flavor, but wouldn’t make it again unless I could cut down on the saltiness – any ideas? I still call fish sauce, Nam Pla – the smell horrendous but essential to Thai food. Spent 7 years living in Thailand as a young girl and we used it, not just for cooking with, but also for burns. I wonder now if that was one of those old Thai wives remedies or if iit actually worked – all I remember is the smell lingered for hours. Just posted about our adaptation of this, used a little less fish sauce and a little more hoisin, some red pepper flakes and soy sauce! Also I didn’t want to bother with making the sauce in a blender so I just whisked it together and it was perfect. I love love love this. It’s really familiar flavours to a chicken dish I used to make as a teenager and have long lost. The skin on my chicken didn’t get crispy at all, which was sad. But yes, I made it with the mango slaw. I do see and addiction in the works. I cook regularly at home for my boyfriend and myself and luckily most of my dishes turn out well and we enjoy our meals together. That being said, I whipped up this and the mango slaw last night and got a wide eyed wow! from my better half confirming this recipe as a cut above the rest. For the chicken I also doubled the hoisin sauce and it was most definitely the way to go; I tasted the marinade before the additional hoisin was tossed in and found it too salty. The mango slaw was a perfect accompaniment too the savory chicken too. My mangoes were under-ripe so I added ~1 Tbl. of sugar to the dressing but otherwise followed the directions to a T. Thank you for sharing! I’m going to make this tonight :). I have some oyster sauce from a beef and broccoli stir fry left over… I wonder if I can substitute that for the fish sauce? I discovered SK only a few months ago, and have made maybe 10 recipes. They’ve all been pretty much fantastic, but — but — this. was. earth-shattering. I don’t know whether it’s that this is a great recipe, or perhaps the tastes are particularly appealing to my palette, but I think I just made the best meal of my young life. I made it with the Mango Slaw, and marinated the chicken for ~10 hours, cooked it to 180 exactly. I think I went a little overboard with the cilantro, and used only 3 tbsp of hoisin. We made this last night, and it was outstanding, even though I didn’t accompany it with the mango slaw and the legs only got to marinate for about an hour and a half once I got my act together. My grill-master partner had them on a very low flame for about half an hour, and they came out salty and crispy and SO delicious – the sweet chili sauce really makes it. 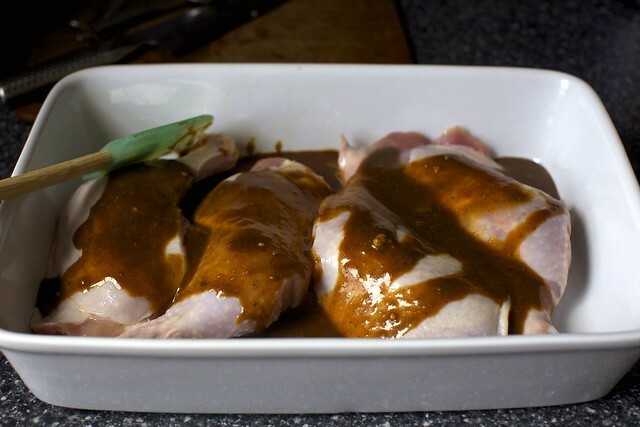 One thing I would do differently is make sure I pat the chicken parts dry after rinsing – I made the mistake of just pouring the marinade on top of the wet chicken pieces and ended up with some pretty thin marinade. Thanks again for another keeper of a recipe. Deb- You crack me up! I love that you live in denial (as I do). I’m not popping your bubble, just embracing mine! This looks wonderful! I have recently been inspired by: figs, chicken thighs, walnuts, balsamic vinegar, shallots, garlic. I don’t know in what ratios I will use them, but use them I WILL! Thanks for the inspriation! BLARGH! Why does there always have to be mango in stuff these days. I love mango but it hates me. Stupid food allergies. The chicken is for dinner tonight! I made this delicious marinade tonight using a whole, cut-up chicken. My 2 year-old and I devoured the thighs and legs. The flavors struck me as vaguely…heading toward a mild jerk chicken (never a bad thing in my opinion). I think it may have been the delicious, savory coriander coming through. I only marinated for about 30 minutes but the results were still sublime. Thanks so much! I made this tonight and it was fabulous. I think I must have marinated it for 2 to 3 days and the flavor was fantastic. I don’t know what kind of oven you have but I had a little over 5 lbs of chicken legs and thighs and it took about 1 hour and 20 minutes to cook through! You must have a magic oven! After all the wonderful comments I will now try this recipe. It is so easy and the results must be fantastic! Hi! Did you know you’ve been mentioned in an online article on the Guardian website for this post? Thanks, hadn’t seen. “Veteran” — ha! Made this one last night; the crispy skin was the best! I too had ~5 lbs of meat in the oven for ~1 hour at 450F. Maybe my on sale, $0.69 lb, chicken thighs were a bit heavy with respect to the bird’s fat/skin. For whatever reason, “too much carmelization” was not an issue! I have a pork shoulder in the slow cooker right now with this marinade. It’s cooked through but not yet falling apart so I’m waiting, waiting, stealing forkfuls every five minutes. Fantastic. i tried your recipe tonight and it came out great! i was a bit hesitant when i saw the color of the marinade at first but didn’t care once i tasted it. my parents said it was delicious! delicious! the gas grill worked perfect, slightly altered from your recco. we have a grill pan for veggies that I placed the chix on. turned those burners down to ultra low and the other side to med. The chix came out extra juicy with perfection! a hit at our dinner party + extremely simple. right up until my mother-loving Pyrex exploded in the oven. I was so very. very. pissed off. Also found this too salty — way, way too salty. Maybe the extra 2 TBS hoisin sauce? Maybe kosher chicken (already salted)? Used a gas grill, so it didn’t cook in the extra marinade, but somehow it was almost inedible. So sad. I ended up cooking the chicken under the broiler and it worked out very well. We had leftover chicken, slaw and rice, so we tossed them together and ate it the next day for lunch. I actually liked it better as a chicken salad. This sounds delicious! I need to try this on the grill… you’re right – too hot right now for a hot, hot kitchen! I made this with a quartered chicken on the grill. It only marinated about an hour, and then was basted while on the grill. Delicious! We had it with mango slaw, despite the warning of an addiction. It’s true. We made both again, in the same week. Thanks again, Deb! I grilled these tonight and they were awesome! I added some hot chiles to up the heat and was so excited with all the flavors… my husband doesn’t care for chicken on the bone but I couldn’t resist this recipe – more for me! Thank you. Yum! I used this marinade tonight on extra firm tofu and then grilled it. Omitted the kosher salt, since the fish sauce made it plenty salty already, and added a bit of sriracha to the mixture since I like a kick. Loved–delicious and unusually savory flavor–I will definitely be serving this for dinner on the reg. I also liked reading everyone’s comments re: fish sauce, which I previously avoided because of the vile odor. Made it yesterday on the grill and it was so popular that I am making it again tomorrow. I made this last night and it was a huge hit with my husband. Great flavor! I actually added about 5 tbs of the Hoisin and went crazy on the garlic…I can’t help myself. Thanks for a great dinner idea! I also found the marinade insanely salty. My theory is that I used regular table salt, which has smaller grains than kosher, so that it ended up being too much with the fish sauce. I had to try and water it down and add more of everything else, and hopefully the chicken will come out of the marinade tomorrow all right. We’ll see – it is a great flavour profile, but also definitely needs a kick of spicy heat! I’m actually wondering if different fish sauces have different levels of salt. That said, yes, you absolutely want to use less table salt if using it to replace Kosher salt in a recipe. I also use Diamond salt, the least salty of the Kosher salts… more about that here. Came out perfectly! After cooking, the marinade tasted totally differently; the salt and fish sauce flavours really mellowed! Wonderful, wonderful! Hi Deb! I’ve been wanting to make this recipe for so long! I’m such a cooking novice, so I have no idea how chicken leg quarters would work. On a whim, I remembered this recipe at the store but didn’t realize it called for whole split legs. The package doesn’t provide a number for legs, but I have two 1.5 (total 3 lbs.) packages of chicken leg quarters. How would this recipe translate here? Thanks so much for any help you can provide! Finally made these, after meaning to for months. They really were good; it’s a nice combination of flavors. Unfortunately I crowded the baking dish too much so they didn’t end up all that crispy but they still tasted great. I think I might cut down the fish sauce if I made them again, though. Maybe replace half with soy sauce. It may have to do with what brand of fish sauce you get a hold of, but it was intense enough for there to be a discernibly fishy taste, which I don’t mind in fish, but it’s sort of weird in chicken. I went ahead and made this recipe with chicken leg quarters. The marinade smelled so good, but when I went to have a lick, I was overwhelmed by the salt (I used kosher) and thus decided to only marinate for a 1/2 hour and even watered down sauce. I’ll definitely omit the salt the next time and marinate for at least a couple of hours. hi – i finally got around to making these last night and they came out great! i didn’t have any fish sauce and used oyster sauce instead. i don’t have a grill, but cooked them in the oven. thanks so much – love your blog! i made these last night, and had marinated overnight. i definitely added too much cilantro, as the marinade was green (and the chicken was green coming out of the oven), but omg, it was so awesomely delicious. must make again. even my dad who doesn’t generally eat my cooking ate it and said i should open a restaurant. ha! ;) thanks for the recipe!!! the chicken was just INCREDIBLE. I just made these last night and they were absolutely delicious. Thumbs up for a new way to make chicken more exciting. But, I followed the marinade recipe exactly and only used 4 chicken legs and it was still the perfect amount–and not too strong even after marinading for nearly 12 hours–I was thinking it would barely cover 8 whole legs? Am I missing something? Either way, it was delicious with ANY number of legs! These are pretty good! Very moist. I do need to get a better-quality fish sauce, and I know that will improve the flavor. I have been making the slaw you paired with this (even more stunning, if a slightly different flavor, red cabbage) and want to try the chicken to go with it — do you have ideas about rounding out the meal with a dessert? Key Lime Cheesecake with Mango Ribbons? I made this recipe this weekend for a group and it was a huge success. Every single person DEMANDED the recipe. And the grilling instructions were spot-on. You rock, Deb. I made the chicken for dinner tonight (I baked it in the oven) and it was PERFECT and absolutely DELICIOUS! Thank you for sharing your recipes. These look delicious. The mango slaw is also amazing. Gonna try the recipe. I know it seems impossible, but if you have leftovers from this recipe, I urge you to do the following: shred chicken, put chicken + mango slaw into wheat tortilla, wrap and enjoy. Yummy next-day lunch! This is the single most delicious chicken I have ever eaten in my life. I made it last night for a dinner with my boyfriend and he even got some bread in the end to finish up the sauce, there was nothing left in the tray! Thank you! I made this the other night, using a cast-iron skillet that I allowed to heat up along with the oven. It was delicious! I was licking my fingers and the plate. I made the mango slaw, too, although it came out more of a chopped salad. Deb, I love every recipe I’ve made from your website! How long do you cook it in the crock pot? For those wanting to try this on a charcoal grill, the instructions are correct in setting up the coals to either side of the grill with a drip pan in the center, but the chicken pieces should be placed over the drip pan with the skin side up. Using the indirect grilling method causes the heat to be reflected by the grill’s cover downward onto the top surfaces of the chicken. Placing the skin side up will allow the skin to become wonderfully crispy. My wife has proclaimed this the best chicken recipe she has ever tasted. I must agree with her! And the grilling instructions were spot-on. You rock, Deb. Silly question, but is the 2 tbsp hoison sauce the already doubled portion, or should I increase it to 4 tbsp to have it doubled as per your recommendation? Christina — 2 tablespoons is the not yet doubled amount. I just made this (roasted in the oven) and it was sooo good! I followed your recipe exactly. Thank you so much. could i cook this on top of foil to aid in clean up, or would it get too sticky? Looks so good. Doesn’t seem like it’ll taste fishy with the balance of hoisin and cilantro. Will have to try amping up the hoisin next time I cook! Fabulous recipe! I made this with the 2 extra TBS of hoisin sauce and it was delicious. Three of my guests were Vietnamese and it made me so happy to see their faces light up at the first bite. Thank you. Amazing chicken recipe. This appears on the regular roster! For anyone wondering, works well with all chicken pieces (including no bone, no skin or skin on and bone in). Serve with any of Deb’s salads and you have an awesome dinner. Julia – I always cook this on a baking tray lined with foil! Hello! We are using you Thai chicken thigh rescipe on Wings! We plan to still bake them. Do you think we should adjust the cooking time? made this just now. Delicious and oh my so juicy! But I didn’t taste so much of the cilantro. One important point I would add may be flipping the chickens at a point of time? because the bottom part was somewhat burnt (the sauce part, not the chicken part)..
Woah! A+. I grilled the meat and used boneless skinless thighs. Awesome leftover. I will try it in the oven next time. Made it in the oven tonight. Delicious, but I found it a touch salty, so I will cut down on that next time. I tried to put a little water in the pan before I put it in the oven in an effort to avoid the burning sauce, but it didn’t really work out. Made this with boneless skinless chicken thighs. Added lemongrass and ginger. Smelled awful before the oven, tasted delicious after cooking. I love thai-style chicken legs .. I think it will taste great to have it with peanut sauce. Thanks for the recipe. but I think I’d end up choosing the easy method rather than the best one. This got rave reviews from my crew, even my youngest who is fussier. I didn’t double the hoisin but will try that next time. As it was, it was great. Unfortunately, my husband doesn’t like cabbage, so I made a salad of mango, some romaine and crushed peanuts instead, with a lime juice/sesame oil/soy dressing – also a big hit and it went really well together. SO good! My four year old said “I’m in love”. For leftovers – shred the chicken and put it on corn tortillas with the leftover mango slaw…..amazing!!! Thanks so much for the recipe! Even substituting white wine vinegar for the rice wine vinegar (out of this, too. Crazy making!) it’s delicious. I found this in my e-mail archive and decided to take a swing at it for the holiday. Oh, my GOSH it is delicious! I wanted to drink the marinade right out of the blender it smelled so good. I took it over to my parents’ house and they cooked it on the grill, and I was lucky to get a piece to save for lunch tomorrow. I threw some whole mushrooms in the bags with the chicken and they were completely gone. The only thing I’d do differently next time is to leave out the salt. I halved it this time and still thought it was plenty salty. To be fair, I’m a low salt cook and am fairly sensitive to it, so it might be the perfect amount for everyone else. Stellar recipe, and I’m excited to put it to work on a regular basis.